The Thermo Scientific -150C Cryogenic Chest Freezer provides secure, mechanical cryopreservation of samples for long durations. This chest freezer is a safer alternative to LN2 systems with controllable temperatures between -140°C and -150°C and at more uniform top to bottom conditions. 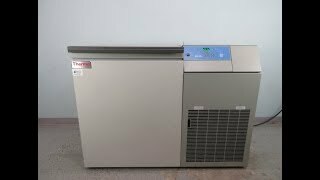 This Thermo Scientific Chest Freezer is cooled with an auto cascade system that uses a single orbital air-cooled compressor, with down feed evaporator. Temperatures are monitored with the Lifeguard compression protection system built to automatically adjust to changes internal and external conditions, an onboard voltage monitoring and conditioning system, and extreme ambient alert if room temperature could affect performance. The Thermo Scientific -150C Cryogenic Chest Freezer has a low-profile design with an easy access, counter balanced lid, lined with double sealed gaskets, and individual sub lids to help keep temperature loss to a minimum. This Cryogenic Chest Freezer is microprocessor controlled with a digital display, and touch pad entry. This chest freezer features alarms to alert users in the case of power failure or temperature deviations and can be connected to an external monitoring system. This thermo scientific freezer is 6.8 cu ft in capacity, holds up to 144 boxes, and has sturdy long lasting and corrosion resistant construction. This Thermo Scientific -150°C Lab Freezer has been fully inspected and is operating without issue. All of our lab equipment comes backed with our standard warranty. Should you have any questions, please don't hesitate to contact us.